FirstGroup has emerged as a frontrunner for the multibillion-pound west coast rail franchise alongside incumbent Virgin Trains, with the contest now a two-horse race between the experienced operators. Aberdeen-based FirstGroup is vying with Virgin despite announcing last year that it is handing back its Great Western rail contract three years ahead of schedule, avoiding more than £800m in payments to the government. The Department for Transport is expected to bank a considerable windfall from the new 14-year west coast contract, with Virgin currently paying an annual premium of about £150m to the state. Both bidders are expected to promise an even bigger number over the life of the new franchise. The winner is expected to be announced next month. It is understood that FirstGroup and Virgin are still in talks with the DfT, but two foreign-owned bidders on the four-strong shortlist are no longer considered likely contenders. They are a joint venture between public transport operator Keolis and SNCF, the French state rail group, and a bid from Abellio, which is controlled by the Dutch national rail operator. SNCF had been hoping to use west coast as a bridgehead into the UK rail market but is now expected to focus on the prestigious, if perennially troubled, east coast franchise that runs from London to Edinburgh. According to one rumour circulating within the rail industry, the SNCF bid considered using extended Pendolino trains that would be longer than station platforms in some cases. This would require passengers to shuffle down the train in order to alight at certain stops – a process known as selective opening. It is not known, however, whether selective opening formed a serious part of SNCF's pitch for the route. The west coast route, which runs from London to Glasgow via Birmingham and Manchester, is already undergoing an expansion. 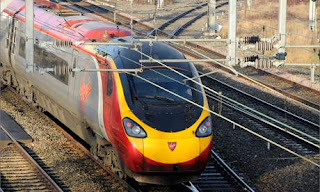 By the end of the Virgin contract in December, it will have 35 trains made up of 11 Pendolino carriages, with a further 17 trains made up of nine carriages. The franchise carried 30 million passengers last year and the contest between FirstGroup and Virgin is thought to be close. Industry sources expect FirstGroup to offer a slightly higher premium number, based on its strong record on cost management, while Virgin is expected to emphasise passenger growth and service. Both contenders have reportedly considered tough cost-cutting measures. According to the RMT trade union, some bidders have been mulling changes to onboard services, which could see the removal of catering and onboard shops, threatening up to 800 jobs, although Virgin is thought to be considering less severe changes. RMT general secretary, Bob Crow, said: "It is disgraceful that bidders for the prestige west coast route are looking at ripping out catering and shop facilities to cram in extra seats so that they can jack up profits at the price of both jobs and passenger service, and we are calling for this scandalous suggestion to be killed off right now." FirstGroup's chances have not been endangered by its early exit from the Great Western franchise, which runs from London Paddington to Wales, the West Country and the Thames Valley. The group had arranged a clause in the £1.1bn contract that allowed it to walk away three years ahead of schedule, ensuring it could end the franchise early without legal redress. If it wins the west coast franchise, FirstGroup could become a dominant player in the UK rail industry. It already operates the First Capital Connect, Scotrail and First TransPennine franchises and is shortlisted for the Thameslink and Essex Thameside franchises, as well as the successor to the Great Western contract that it is relinquishing. The DfT, mindful of the plight of the east coast franchise, after National Express reneged on a £1.4bn contract, is understood to be seeking beefed-up insurance policies from west coast bidders. This could include a large "performance bond" that will be paid out if there is a default. Another possibility is a cross-default clause, which would see an operator forced to hand over other rail contracts if their franchise goes sour. Virgin Rail Group is co-owned by Stagecoach, the public transport operator, and Sir Richard Branson's Virgin empire.